More than ever, warehousing facilities play a vital role in the overall supply chain process. In an ICT environment where carving a competitive edge is an imperative, the ability to timeously process and supply product demand is key. Official South African distributor KOLOK SA has announced the immediate availability of Pantum’s new range of compact and eco-friendly printers, the P2500 monochrome laser series which readily meets the need for small footprint devices that are packed with productivity gains such as Wi-Fi capability and mobility integration. Pantum is a leading laser printing technology provider. KOLOK and Intel SA, in partnership with InterSite, an asset investment subsidiary of PRASA and a number of key contributors have launched a ground breaking eLearning project, the KOLOK Education Solution (K-ED) which, for the first time, utilises the existing railroad fibre optics infrastructure to provide connectivity to schools nationwide. Pantum International’s first range of laser monochrome multi-function printers (MFPs) the M6500NW, M6550NW and M6600NW devices that offer affordable print, scan, copy and fax (M6600NW only) combined with the company’s one-toner-only functionality and robust form factor. Internationally, the sale of dash cams is soaring with vehicle owners increasingly using it as evidence after clashes or crashes with other road users. Similarly, South Africans are starting investigate the benefits of dash cams that not only record road incidence but also offer safety and GPS features. Our large-format expertise is firmly set in years of experience in this specialist marketplace. 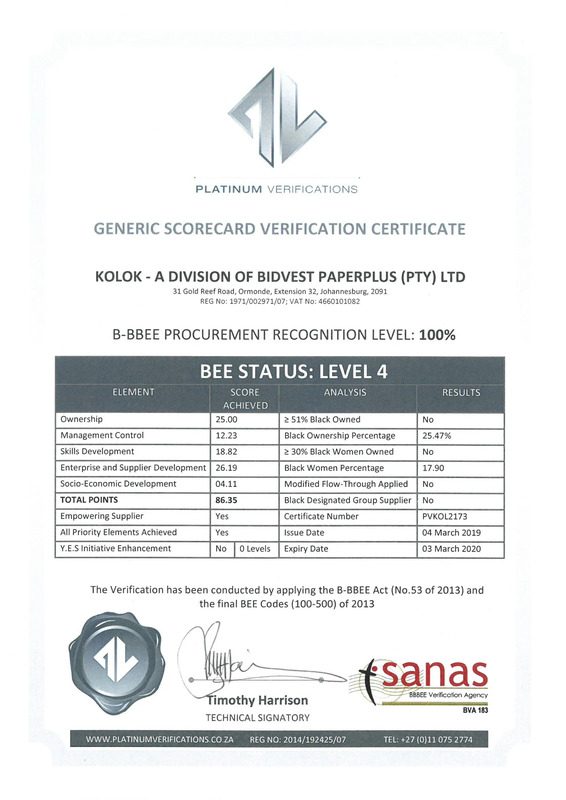 Previously a division of Ozalid which was established in 1938 and forms part of Bidvest Paperplus, a wholly-owned trading division of The Bidvest Group Limited, The Paper Plot merged with KOLOK in June 2015. Mobile accessory and peripheral brands Volkano and Amplify are now available to the channel from KOLOK, an ICT distributor and Bidvest company. With mobile technology continuing to drive market demand for complimentary accessories, both Amplify and Volkano offer a wide range of products to fit today’s on-the-go lifestyle. Recently appointed SandDisk distributor, KOLOK – a Bidvest company - has announced the immediate availability of the SanDisk Connect Wireless Stick to the South African channel. The device allows for easy sharing, transferring and accessing files between mobile devices and PCs. SanDisk Corporation, a global leader in flash memory storage solutions and now part of Western Digital Technologies. The agreement, effective immediately, extends KOLOK’s product offering into data storage channel and subsequent marketplaces. © Kolok 2019 All right reserved.